Adorama.com [adorama.com] has Fender Limited Edition Mustang Bass PJ Electric Guitar on sale for $399. Shipping is free. Another Lag guitar on sale at Adorama. For those who don't care about plugging in (I'm shopping for acoustic electrics, or I would have bitten) and just want a nicer acoustic, this is a full dreadnaught. Listened to a few videos online and it sounds really really nice. QA note: If you don't see $169.99, try on a mobile device. Adorama once again has all the Polk LSiM speakers on sale all in one spot. Tascam DR-05 for $66.66. Seems like a good price. Main difference between this and RX-2080 is that this unit has 1 year less of warranty. the rest, such as features, power, speaker support, components, as far as I can tell based off specs, is identical. 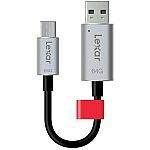 Adorama / Adorama @Amazon has 64GB Lexar C20c USB 3.1 Type-C JumpDrive Flash Drive for $8.99. Shipping is free. let me know what you think... would appreciate some input on the quality of this keyboard! while supplies last. sold as singles.